A Gold Star Mother plate may be issued for an auto, motorcycle, or truck registered for 20,000 lbs. or less which is titled in Kansas in the name of the applicant or leased by the same. 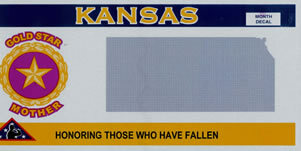 A generous donation from Neva Heiselman, Holton, Kansas, paid for the issuance of these license plates. Be the mother of a service member killed on active duty. Meet the conditions and/or requirements as listed on the Gold Star Mother Plate Application, form TR-170. Complete and sign the form, which is on the web at https://www.ksrevenue.org/pdf/tr170.pdf. Make application and submit the completed and signed Gold Star Mother Plate Application, form TR-170 to your local county treasurer's office. Regular registration fees are due at the time of application or renewal. Property tax must be paid for the vehicle registered with a Gold Star Mother plate.